Need to get your math station materials organized? One of the most challenging parts of implementing math stations is staying organized. 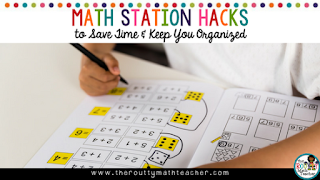 Because math stations have a lot of moving parts, it can be time-consuming to manage all of the materials; however, if you invest the time upfront to organize your materials, it will save you hours of time later. One of the strategies that has been most useful for me is to keep station games and activities organized in labeled plastic bags that include all of the necessary materials. I can then store the bags in a file cabinet for easy access later. 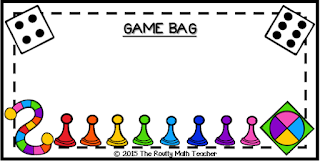 Click here or on the image above to grab a free set of labels to use in your classroom to organize your game materials. The labels are formatted for Microsoft Word and can be printed on Avery (5163)-style shipping labels. After printing, write the name of the game in the center space. Head on over to The Routty Math Teacher website (or click the image below) for more ideas to organize your math station materials. Find it here!